· The #HumansOfMKTG get together at our Roundtable to discuss their favourite brand and non-profit partnerships. · Our team not only provides an overview of their chosen partnerships, but their insight on the tactics used to create a successful collaboration. · Through our discussion, we realized a common theme: an organic non-profit partnership is one that is true to brand, creates a long-term commitment and goes beyond traditional campaigning efforts. It’s an industry standard to have corporate social responsibility; but how do brands showcase their CSR initiatives organically to consumers? Tons of brands create short term awareness campaigns and one-off spots for social, environmental and ethical issues - but consumers are smart. They want to see what tactics brands are implementing that are making a difference that are beyond deploying a digital spot in support of a cause. We gathered the #HumansOfMKTG to research and pick their favourite partnerships that execute a true relationship between a brand and a non-profit organization – whether it’s through a long-term commitment, helping less fortunate communities build their infrastructure or helping the non-profit create tactics that are outside-the-box. The following Roundtable consists of the following #HumansOfMKTG: Soha, Matt S., Neal, Iain and Alex. 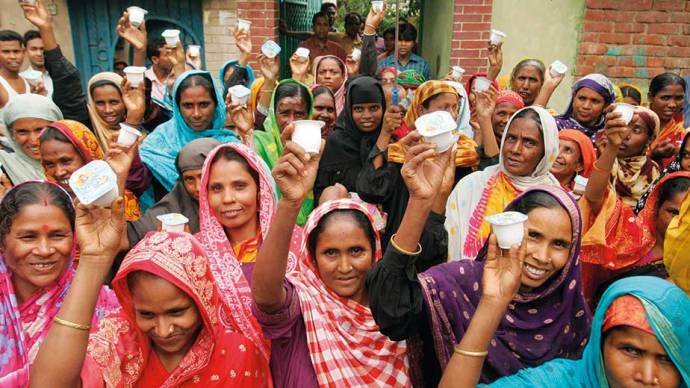 “Multinational food-product corporation Danone and non-profit microfinance organization Grameen Bank partnered to create Grameen Danone, a social business enterprise that aims to bring prosperity to rural Bangladesh. The brands partnered to create Shokti Doi, a yogurt made in, by, and for, locals. The objective was twofold- to bring nutrition to low income populations and alleviate poverty through the implementation of a community based business model. Combining Danone’s food-product expertise with Grameen Bank’s cultural and financial knowledge- the two brands took the usual temporary, donation-based CSR initiative template and elevated it to create an innovative and sustainable program. “Since 2015, ABI-owned beer brand, Stella Artois, has been a partner of Water.org for its “Buy a Lady a Drink” campaign, which aims to link purchases of the brand’s famous chalice to providing water for women around the world who do not have access to it. In 2018, the brand launched its first Super Bowl ad since 2011, featuring actor Matt Damon (who is a co-founder of Water.org) to inform viewers that the purchase of one limited edition chalice could provide clean water for a person in need for up to five years. “With the widespread adoption of products like the FitBit and Apple Watch in recent years, wearables have definitely gone mainstream. Back in 2015, a surprising player was at the forefront of this trend: UNICEF. After a successful pilot program in schools, UNICEF partnered with Target to go national with their “Kid Power Bands” – a $40 activity tracker specifically designed for kids, available in-store and online exclusively at Target. These were no ordinary wearables however: the more active kids get, the more therapeutic food UNICEF provides to malnourished children. By logging into the Kid Power companion app, kids accept “challenges”, compete against their friends, redeem their activity for food donations, and learn more about the issues that they’re helping to solve. Donors want to know how their actions and donations are making a direct impact in issues they care about. UNICEF and Target have definitely struck a chord with this initiative, with Kid Power wearers having walked more than 100 billion steps and helped save the lives of 52,000 severely malnourished children already. UNICEF seems poised to take this initiative even further, having partnered with Disney for Star Wars “Force-for-Change” themed bands, and leveraging their ambassador P!NK to introduce it in even more schools. We are seeing more and more brands commit further to support causes they attach their name to; going beyond a simple campaign and truly making a difference.